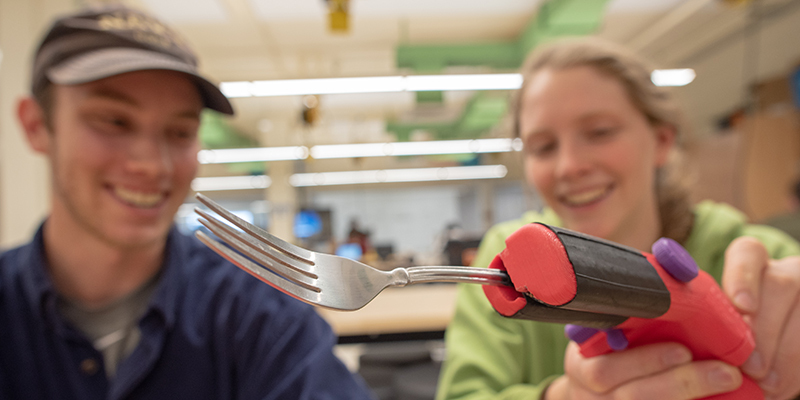 Last September, a team of four UVM engineering students received a challenge from Nick Dechev, the executive director of the Victoria Hand Project: build two better hands—one for riding a bike and another for holding cutlery. “We’re almost done,” says mechanical engineering major Katie Stokes. She holds up a red-and-purple plastic device with two finger-like extensions holding a fork firmly in their grip. The Victoria Hand Project works with amputees in seven developing countries, from Haiti to Cambodia, using 3D printers to produce custom-fitted prosthetics—that local people can afford and local medical professionals can manufacture and service. “The current models they produce are aesthetically pleasing, and are able to assist users with a broad range of tasks,” explains mechanical engineering major Alex Troche. The Victoria devices are also body-powered and able to be manufactured for about $80 worth of materials, key advantages in poorer parts of the world. When a person loses their hand or arm—perhaps to disease or warfare—they may face many challenges from writing to opening doors to getting a job. A well-engineered prosthetic can restore important capabilities—but in many developing countries, access to prosthetic care can be hard to find and good prosthetics too expensive. 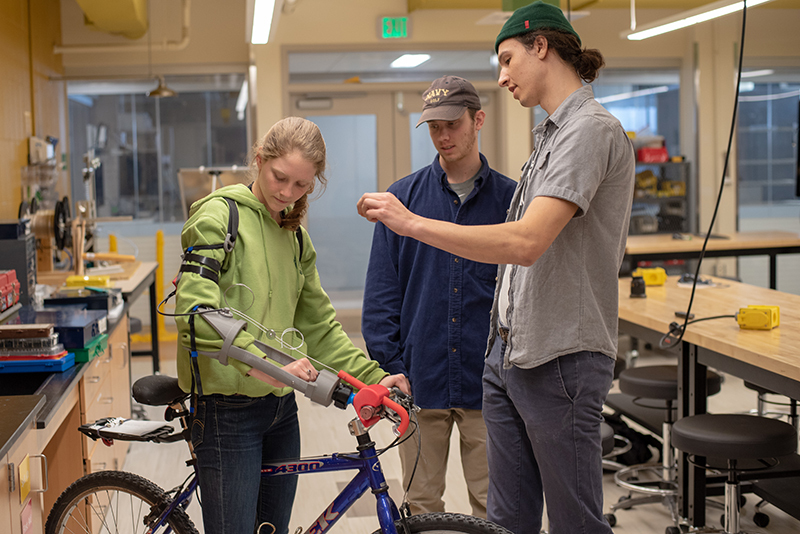 The Victoria Hand Project is working to overcome these challenges—and the UVM team’s academic task is to help out with a well-considered pair of prototypes, ready to present during the College of Engineering and Mathematical Sciences’ Senior Design Night on April 26. But the students’ most important test will come long after they’ve graduated, when people go to use the prosthetic hands they designed.